The following is written by Jessica Diemer-Eaton and presented by Woodland Indian Educational Programs. This page is designed primarily as a free online educational resource on the subject of historical-traditional Great Lakes twined bags. To cite the information from this page: Diemer-Eaton, Jessica. (2019, March). Traditional Great Lakes-Style Twined Bags. Retrieved from http://www.woodlandindianedu.com/greatlakestwinedbags.html Second to an online resource, this page also shows the twining work of Jessica, who makes such styles of bags for the needs of organizations and individuals… whether for exhibit and educational use, or regalia and personal use. The following pictures are of her twining works, accompanied by informational text. The bottom of this page contains links to view original bags, and contact info for those in need of a source for twined bags. It’s the alternate crossed-warp twining of the “panel,” and sometimes outer “bands,” that created the images, whether figures or symbolic patterns (as it is the warps, not the wefts, that carried the color and patterns). Altering the pair warps to expose or hide one pair or the next, creating what appears to be diamond or x patterns close up, but overall, resulting in a larger image or pattern on the bag. Needless to say, it’s one of the more complicated twining styles used in the Eastern Woodlands. Jessica Diemer-Eaton twines on the Thunderbird side of this panel bag (2017) - This bag now a part of an Illinois museum's educational kit. It’s truly an age-old Indigenous art that, specifically in the Western Great Lakes, survived colonialism in the form of storage bags. This is a history most Woodland Peoples cannot claim… twining, often like pottery and stonework, did not last long as a skillset among most Eastern Nations. 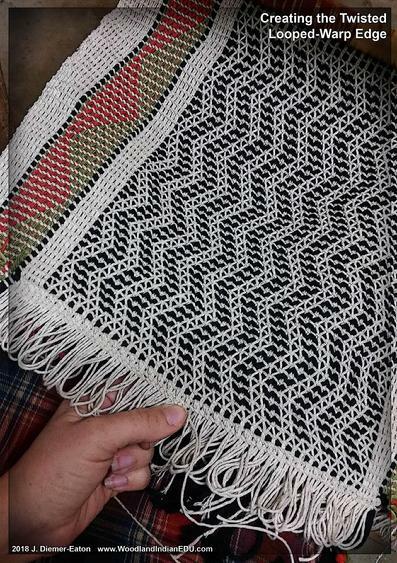 It often disappeared early after Anglo trade was established, even if the culture had a rich background in the making and wearing of fiber textiles. Early observations noting the thriving craft soon gave way to no mention of such a practice,… or the memory of making such was noted, maybe with some old textiles around made a generation earlier. 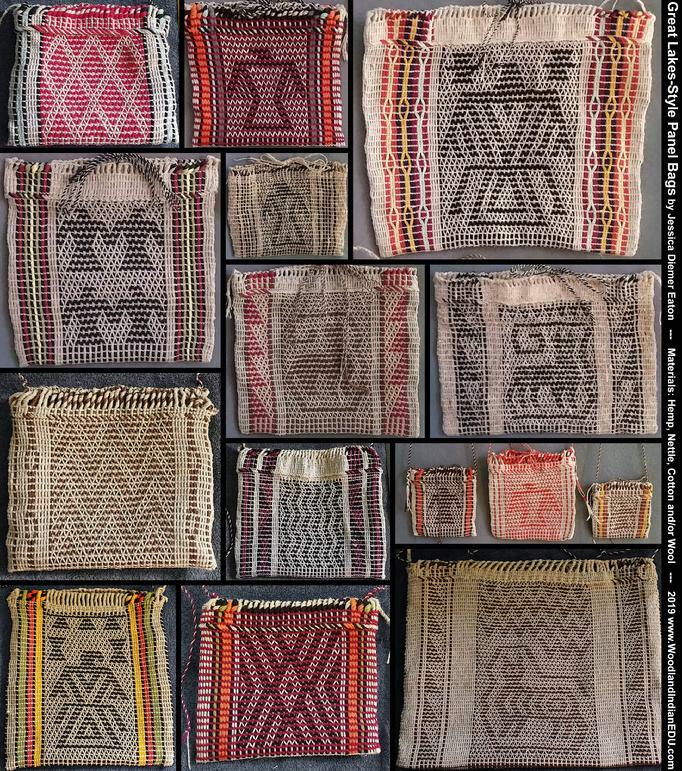 But not so for some Great Lakes Nations who carried on the tradition of twining far later than first European contacts… Such bags are famous among Ojibwe/Anishinaabe - Ottawa/Odawa - Potawatomi, Meskwaki/Fox - Sauk, Menominee, and Winnebago/HoChunk, but also used by the Iowa and Eastern Siouan Peoples, and most certainly made and/or used by others who called this region their original homelands (like the Kickapoo and Miami/Myaamia) or called it home post-historically (such as the Stockbridge-Munsee). 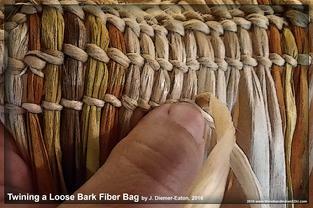 Historically bark fibers (like basswood) and plant cordages (like nettle), natural and dyed, were used to create these bags (and buffalo wool cordage could take the job of contrast warps when and where available). 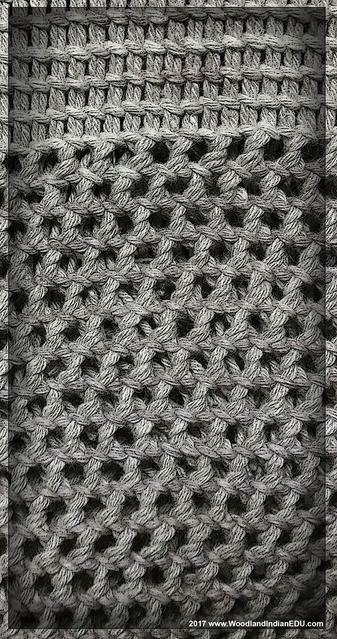 Post-historically wool and cotton strands, twisted from blankets and fabrics, were added for the colored warps (sometimes even the weft). Later as wool yarns and cotton string became more available, the bags themselves incorporated more of these materials, some later bags being made solely from cotton cord. These bags often shared similar characteristics across time and cultures, such as no-seam/closed bottoms (A). 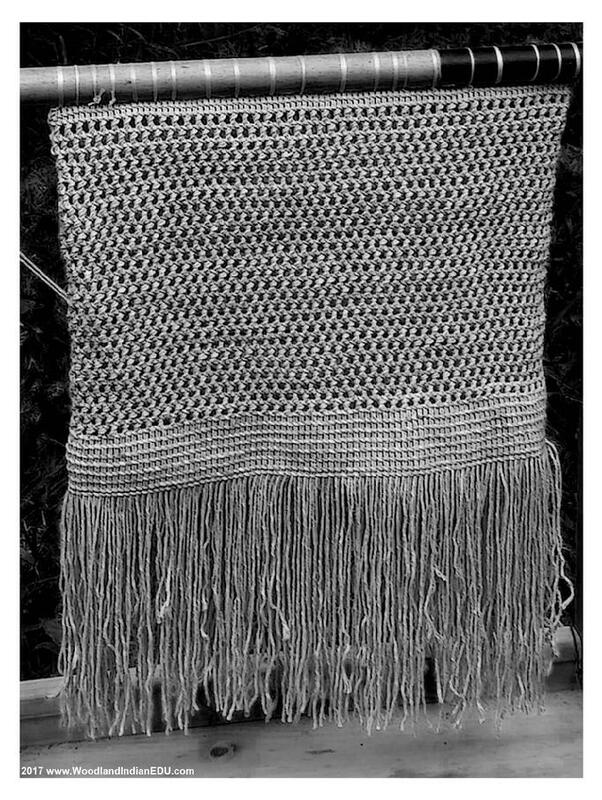 These bags were usually created with the “single or one-stick technique,” not with a “two-stick technique,” which allowed the weaver to start the bag with a closed bottom, also known as a “pocket-style” of twining (the two-stick technique creates an open bottom… “tube-style”… which requires the weaver to close the bottom as part of the finishing of the bag). 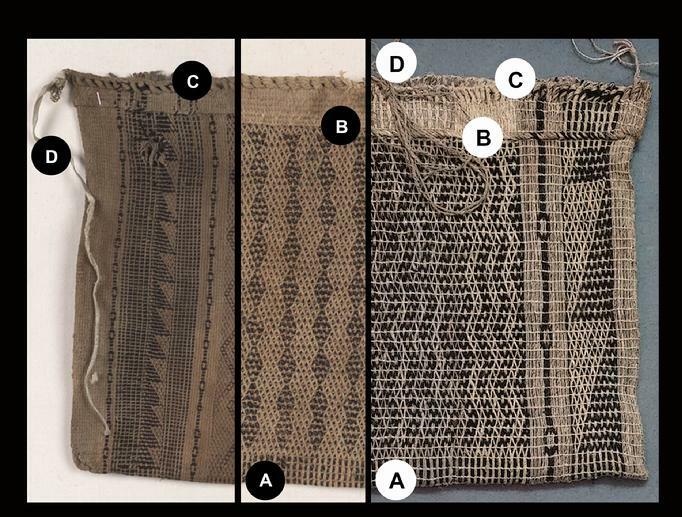 Another characteristic was the visual stopping of the dark warps, part of the panel (center image), at the collar of the bag (B) – most historic panel bags feature this, but not all (some of the bags I make feature this, some do not). This style of bag more often features a looped and twisted hem at the opening (sometimes braided, less often a wrapped edge as “a fix” to an older bag that lost its original hem), which also creates the signature “collar” (C) at the top of the bag. Some collars were wide, others narrow – the collar was a product of the looped and twisted hem (and the securing of the ends on the inside of these bags are just my own style… I like knotting ends for strength, which is invisible from the outside of the bag, though sometimes I go with a more traditional tuck in of the edges on the inside, which goes into (D), the ties. (D) Ties were made of the same material as the bag, or sometimes leather or lacing tape. Panel bags were laced at the hem to close the bag and secure it’s contents. Often there was only one detached tie, very long, able to cover the hem twice over. Other times the tie was shorter, and only secured the bag at one point at the center of the hem (especially smaller bags/pouches). And sometimes there were two ties that started at each end of the bag and met at the center to tie off (it also appears a single long tie could be attached at one end too… this all probably for the convenience of keeping ties with their bags when not laced up). 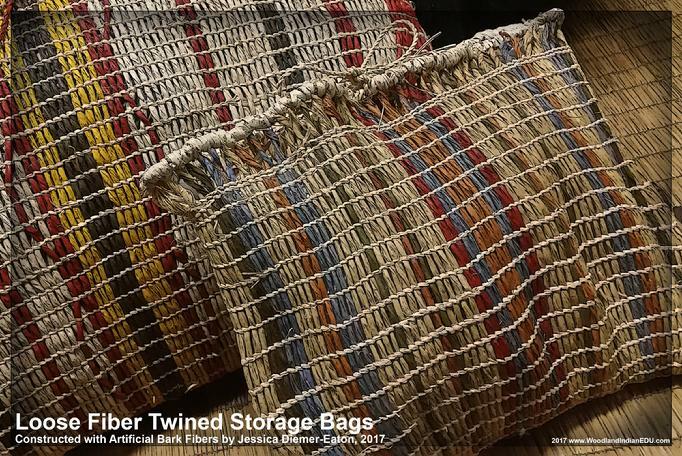 Most twined bags of post-historic times in the Western Great Lakes region were generally designed to store and place/hang in the home (usually hung by the knot at the center of the bag along the hem). 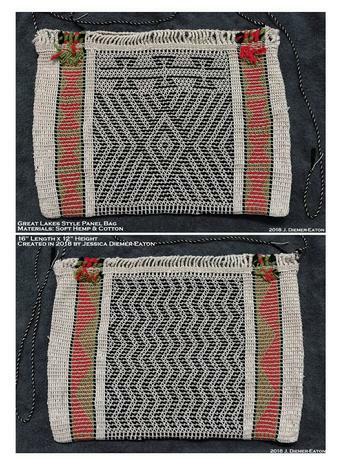 Below are some more examples of Great Lakes-style panel bags twined by Jessica Diemer-Eaton, from 2017-2019,... all are now owned by individuals and museums, serving as educational tools and traditional containers. The corn-hulling bag, often sharing the label and presumable use of a storage bag, have an “open” twined structure, giving the bag the ability to wash corn kernels efficiently. Corn-hulling is the process of treating corn with a lye (made of a solution of ash and water) to effectively burn the hulls of the corn… and before the corn can be consumed (which is then hominy after being soaked in ash water) it must be rinsed quite a bit to rid it of excess lye residue. It’s very obvious this type of bag served as the perfect colander. Similar bags with an open twined body are also labeled as storage bags (some bags marked as both). 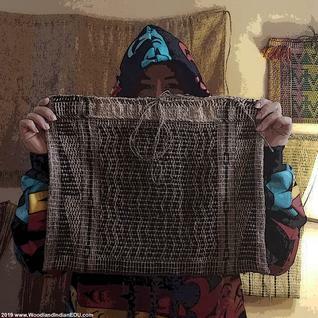 It’s likely that not only could such a bag do the job of both (rinsing corn when needed, and storing away items or food stuffs when not), but when the bag was becoming too worn out, it may have been then retired to act only as a storage bag. Below: Historical examples of corn-hulling/storage bags, housed in museum collections (see bottom of page for links to view such bags online). Above: Twining a corn-hulling bag, by Jessica Diemer-Eaton, 2017. To create the open twine-work of these typed of bags, warps were transposed with neighboring warps. The structure varied depending on the twisting of the warps. These bags were generally made of inner bark fibers (like basswood), either loose fibers or twisted cordage. They presumably could have also been made of plant fibers, like those from nettle or dogbane. Above: Two types of twining structures used for corn-hulling bags - by Jessica Diemer-Eaton, 2017/18. 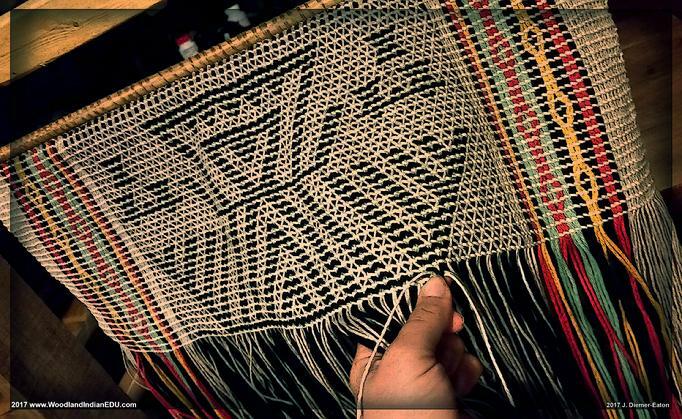 Storage bags are often made with a warp-faced plain twine structure, though sometimes warps were transposed or diverted to create designs. These bags were plain or colorful, with colored strips or designs running vertically. 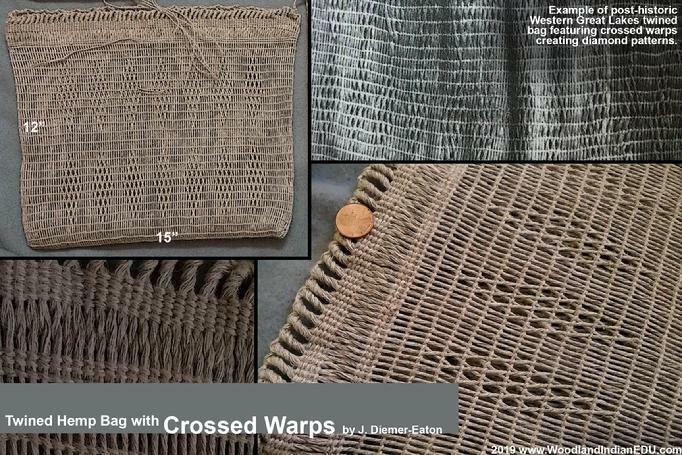 Usually bark inner fiber were used to create these bags, the warps being created by either loose fiber or twisted cordage. 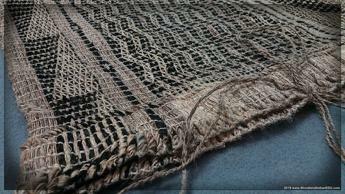 Again like the corn-hulling/storage bags mentioned earlier, plant fiber cordage could replace bark fiber warps or wefts. This section is currently "under construction." Educational content coming soon. 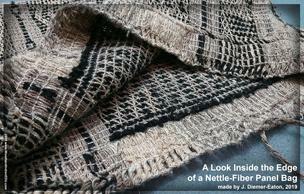 For now, please enjoy the images of my textile work. Please check back later as we add to this page in the next several weeks -WIEP (3/5/19). Above: Historical Panel Bags in Museum Collections... View Collections Through Links Below. We think the best online resource to view historical twined bags comes from the American Museum of Natural History’s online collection database. 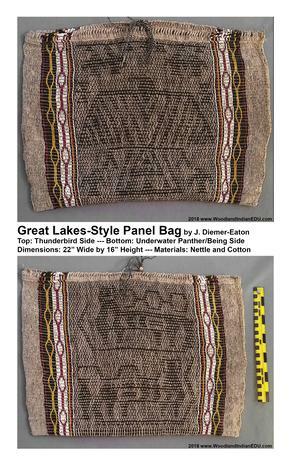 To view their vast collection historical Great Lakes-area bags - panel bags, storage bags, corn hulling bags… warp-faced, weft-faced, and open structure twine work – go to https://anthro.amnh.org/collections and in the search panel (to the left) fill in twined bag for Search (keep Object Type/Catalog Number in the space just right of it), North America for Collection Areas, All for Collection Type, and All for Cultures… then hit the SEARCH button. Their collection of twined bags (and related objects) totaling almost 150 items will come up for you to browse. 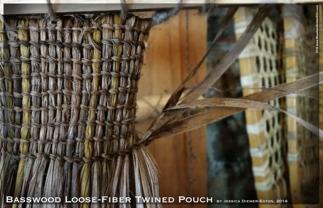 The Museum of the American Indian has a few Great Lakes twined bags viewable online. Go to https://collections.si.edu/search/ and plug in twined bag into the search box. Many different twined bags from different cultures all around American will come up, but a good handful are from the Great Lakes region. And check out the Detroit Institute of Arts Museum’s collection search at https://www.dia.org/art/collection - plug in the keyword phrase storage bag to view a few Great Lakes bags in their collections. There are certainly more images of these traditional bags online, but these three collections given above are great online resources to start with. Above: Western Great Lakes from Wisconsin Historical Society/Museum Collections. All-cotton panel bag (left and middle) inspired by later 19th c. bags (right), twined by J. Diemer-Eaton, 2018. * Please Note: If you are interested in owning and collecting Native art, we (WIEP) encourage you to do so... to support Native artisans by purchasing pieces created by enrolled tribal members. However the twined bags pictured here and offered by WIEP is not Indian-made art... As we like to say, this is just Jessica-made stuff... made for the purpose of educational and traditional use.